The beauty trends forecast for this autumn and winter 2014 are that lips will be left pale or with a natural hue, eyes will be stealing the stage. I recently focused on lived in eye make up as a trend for this AW14 as seen by Topshop Unique but here are some of my favourite other upcoming trends. Valentino’s AW14 collection included a youthful beauty look with clever illuminating contouring on the face and a touch of grey eye liner to define the eyes. Eyebrows were natural, full and neat whilst eyelashes had a coating of subtle brown mascara. 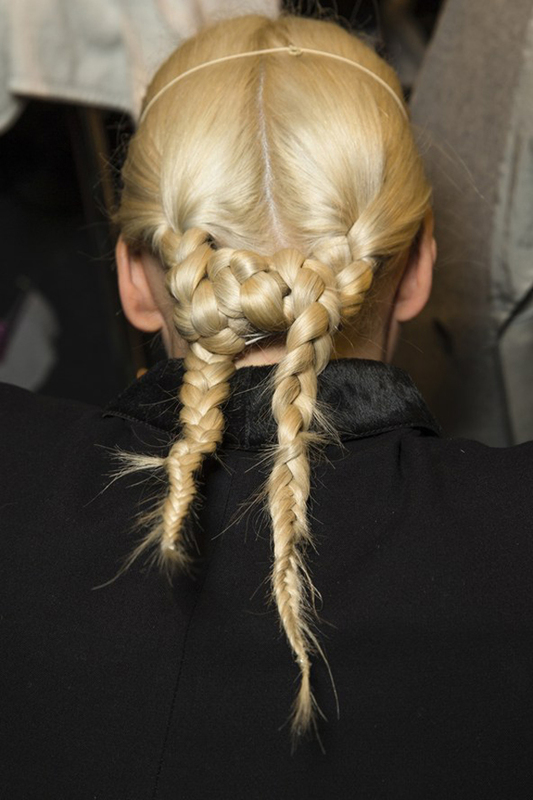 Hair focused on waves, loose ponytails and low, centre parted gathered ponytails, creating a plait like effect with black elastic. 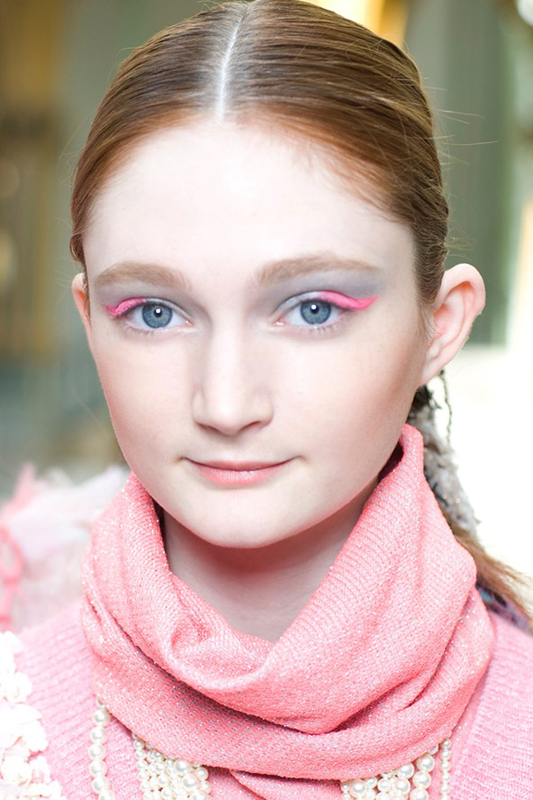 For a more dramtic eye look Chanel again used the silver, grey tone around the eye but added a colourful cat eye wing in a range of shades, neon pints and orange, metallic blues, reds and teals. Eyebrows were fuller, cheeks had colour under the cheekbone to give a more contoured, hollow look and lips had a touch of natural colour. Hair again was in a low, centre parted ponytail at the base of the neck but given a fuller ponytail look with woven tweed strands. 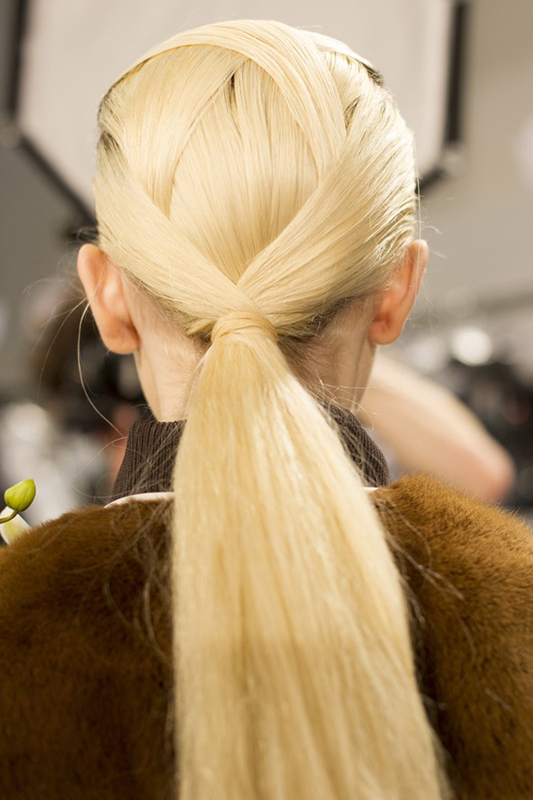 Others also restyled the ponytail including Alexander Wang, Fendi and Jonathan Saunders. Other hair trends were the Chignons at the base of the neck and braids. 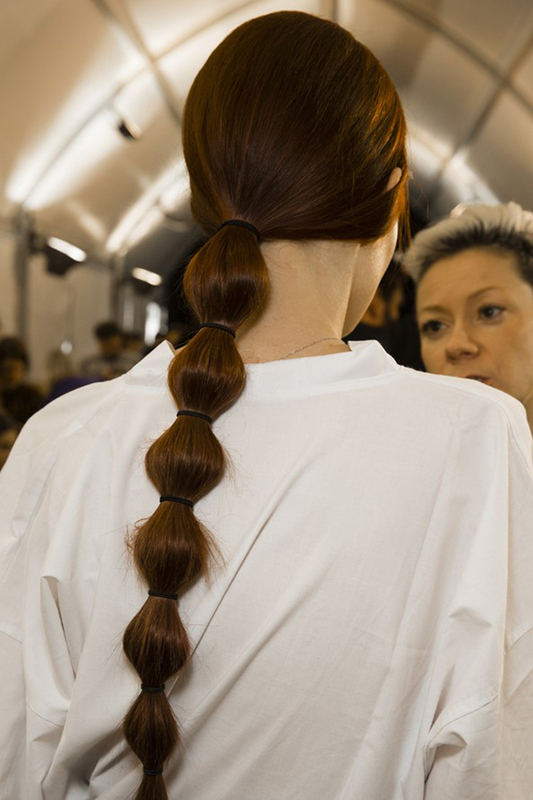 Marc by Marc Jacobs styled two school girl plaits with a headband whilst Givenchy knotted two plaits together at the nape of the neck to create a chignon. 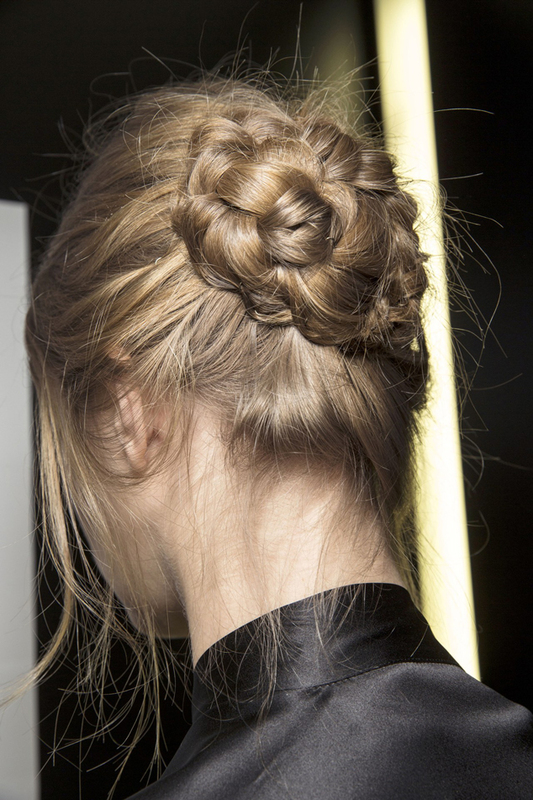 Prada styled a centre parted low bun whilst Dolce & Gabbana kept their braided low bun more easy carefree, a DIY look with loose textured tendrils giving the off-duty ballerina hair. Waves, Braided Chignons at the base of the neck, Low centre parted ponytails. 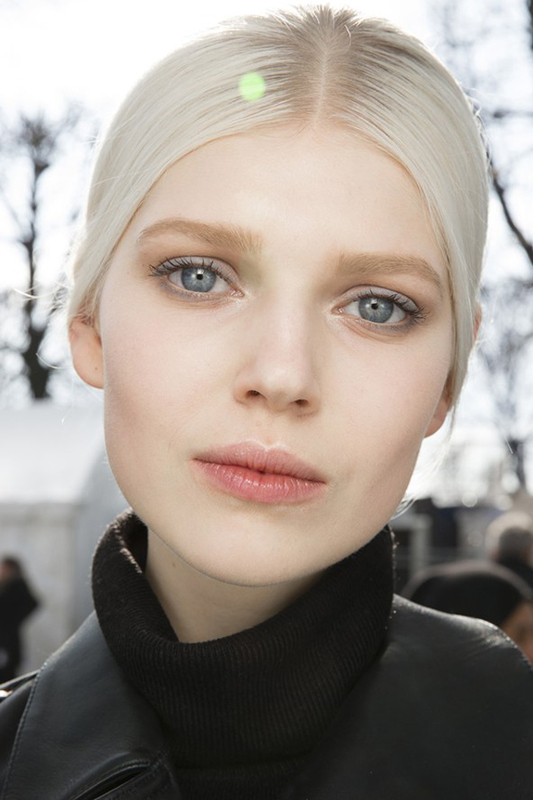 What Beauty and Hair trends are you looking forward too this Autumn Winter 2014?